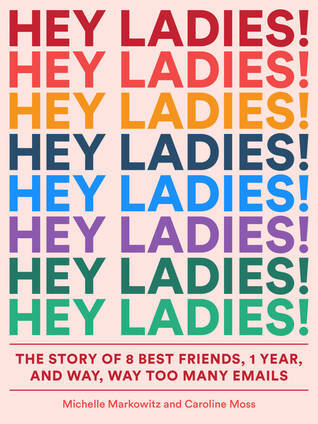 When I stumbled upon the book “Hey Ladies! : The Story of 8 Best Friends, 1 Year, and Way, Way Too Many Emails,” by Michelle Markowitz & Caroline Moss, I thought – hey, this sounds like a pretty good read! Sounds fun, flirty, quick, and easy. Plus, as a 27-year-old woman, reading about fictitious women in their 20s and 30s would be great, right? I hoped, and expected, more out of this book. Instead, it was a mostly-unrealistic, very exaggerated ‘tale’ of NYC women. Okay, so I don’t live in NYC, but… I’m pretty sure the authors just took every possible horrible cliche, plus some extraordinarily unlikely happenstances, and threw them in this book. First question: what in the world do these women do for jobs? I work full-time, pay rent/bills, buy food, go out once in a while, etc. But there’s no way in hell I’d be dropping $300 for a night out here, $500 for a dress here, over and over again. Yet… they can? Or at least, seem like they can? Oh, and dropping major cash for a summer home rental? No problem. Last-minute weekend trip to South Portugal? Absolutely! Their relationships with men are also cringe-worthy. One of them literally threatens to break up with her long-term boyfriend because he seemingly has to work on Valentine’s Day? Seriously? (They then actually get engaged instead.) The other’s relationships aren’t any better. While I’m all for doing what’s right for you, it’s just bad. At one point, there’s talk of a possible ‘accidental’ pregnancy in order to get a BF to stick around! Come on! Also: do people really use Venmo that often? And buy things on behalf of their friends without their permission? And expect their friends to just… fork over the cash like it’s nothing? Another point: WHY ARE THERE SO MANY EMAILS. Okay, I should’ve expected that based on the title, but why in God’s name are these women emailing each other SO. MUCH. Haven’t they heard of picking up the phone to call, or even just texting?! Nicole is unreliable with money, yet somehow gets some money and… starts her own business? And then wants to bribe her friends with shares of the company so she doesn’t have to pay them back for anything? I get it – it’s mean to be humorous, and the style of writing a book through almost exclusively emails is unique! But I cringed much more than I laughed, and it’s sad, because I was really looking forward to this book and thought it would be a fun read. It’s absurd. Can we get less books about toxic female friendships and more about strong women who lift each other up instead? Okay, thanks, bye.